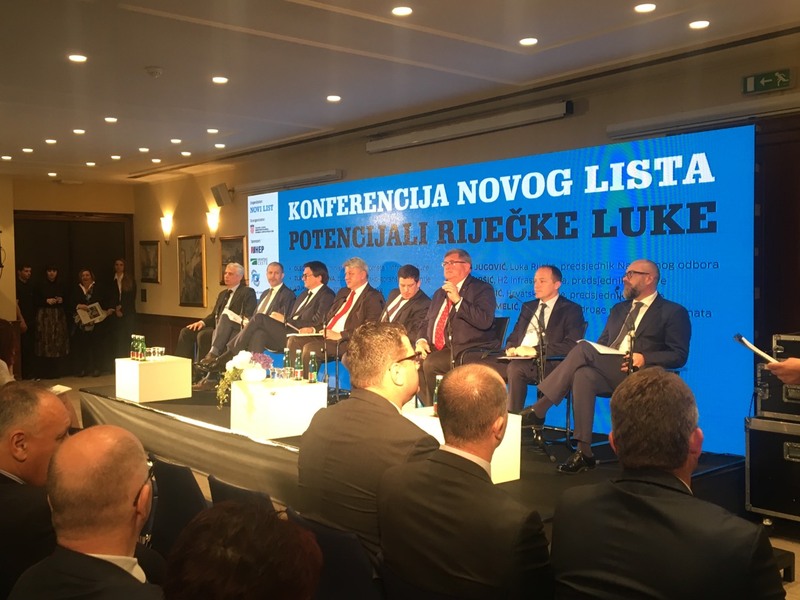 As part of the celebration of the 300th anniversary of the proclamation of Rijeka as the free Royal port, the conference “Potentialities of the port of Rijeka” was held at the hotel Bonavia organized by Novi list. The conference was attended by Minister of Sea, Transport and Infrastructure Oleg Butković, Mayor of the City of RijekaVojko Obersnel, Primorsko-goranska County Prefect Zlatko Komadina, Executive director of the Port of Rijeka Authority, Denis Vukorepa, President of the Supervisory Board of Port of Rijeka j.s.c. Alen Jugović, President of HŽ Infrastructure Ivan Kršić, Managing Director of Hrvatske ceste Josip Škorić and President of the Association of Maritime Agents, Jakov Karmelić. Although organized on the occasion of marking an important historic anniversary, the conference was dedicated to the future of the port of Rijeka, which is situated on one of the ten most important transport corridors (TEN-T network), and due to this important location as well as to numerous significant investments in infrastructure and access network, the port today faces a turning point that will determine its development for a longer period of time. The participants and conference guests were initially welcomed by Editor-in-Chief of Novi list Slavica Bakić and Minister Butković. 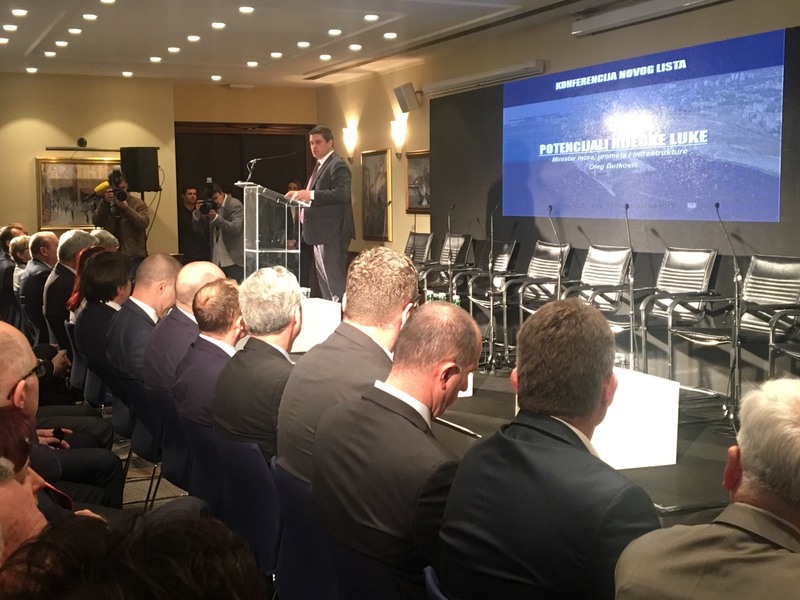 On that occasion, Minister Butković recalled that investments in total worth EUR 390 million that were allocated to port of Rijeka, with a significant share of the European Union funds. In May, the construction of the Zagreb Deep See Container Terminal is going to complete a 16-year long Rijeka Gateway project, which will be accessible by state road D-403 in construction, (a tender for the contractor is announced in April). He also stressed the importance of railway infrastructure and added that the low railway project is a key rail infrastructure project in Croatia. Mayor of Rijeka, Vojko Obersnel, expressed satisfaction with the intensification of projects and cooperation with the ministry of Sea, transport and infrastructure, despite the slower running of projects than expected , pointing out that there has never been so much investment in the Rijeka traffic direction as today. Perfect of the Primorsko – goranska county, Zlatko Komadina welcomed this investment momentum and projects that he rated generationally, but reminded that implementation of the projects were seriously delayed in the implementation of the projects, which is why the real potential of the Rijeka port is far greater than the current traffic. Executive director of the Port of Rijeka Authority, Denis Vukorepa focused on the great opportunities from investments in progress resulting in Rijeka to become a strong logistics center with a a new dimension of the traffic direction. President of the Hrvatske ceste (Croatian Roads) Josip Škorić said that the planned deadline for the completion of the D-403 road is 30 months, and after its completion, the center of the city will be significantly diverted, especially with the expected increase in traffic thanks to the new terminal. The CEO of HŽ Infrastructure, Ivan Kršić, underlined the importance of arranging an intermodal terminal at Brajdica worth EUR 36 million, which is under way, and planned planning of a similar terminal on the Zagreb Deep Sea Container terminal.